The International Whaling Commission has just unveiled a proposal to legalize commercial whale hunting for the first time in 24 years. Countries are now deciding their first responses — and they’re watching public reaction closely. New Zealand called its provisions — which include a legal quota for hunting endangered fin whales — “offensive,” “unacceptable,” and “inflammatory.” But other key nations are rumoured to be leaning in support of it. They need to hear from us now. A strong international consensus has opposed whaling for decades — but for just as long, Japan, Norway, and Iceland have continued to hunt whales, ignoring the global ban on whaling or exploiting a loophole by claiming their expeditions were “scientific research.” Now they could be rewarded by this “compromise” proposal, in which their commercial whaling would be made legal in exchange for unenforceable promises to slowly reduce their yearly catch. Forty years ago, whales were on the brink of extinction. 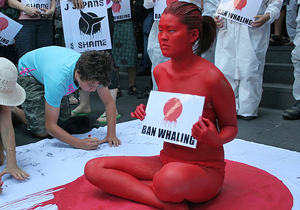 But thanks to a global social movement, the world banned commercial whaling in 1986. The ban is one of the environmental movement’s great triumphs.